The staff were incredible. They were friendly and helpful whilst working 16hr days and dealing with customers showing no respect. I didn't particularly like the other guests. Loud, large, rude and wasting so much food at the buffet. There should be some sort of measure in place as the amount of uneaten food left of the plates for the staff to clean up was shocking. 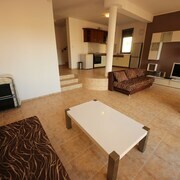 Location is good, next to the beach with plenty of shops around. Not much for sightseeing though. Where to find Kosharitsa hotels near an airport? Where can I find hotels in Kosharitsa that are near tourist attractions? 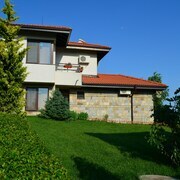 You will find a wide range of room choices in Kosharitsa. Expedia currently features 111 places to stay within a 0.1-kilometre (0.06-mile) radius of downtown Kosharitsa. There are several accommodation options that are within a short stroll from Kosharitsa's heart, including the Green Fort and Grand Victoria. The Sol Nessebar Mare is positioned 10 kilometres (6 miles) from the main part of Kosharitsa. Another accommodation option is the Sol Luna Bay Resort - All Inclusive, which is positioned 18 kilometres (11 miles) away. 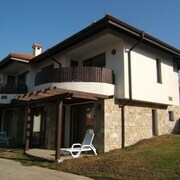 Two other places to stay here include the Iberostar Sunny Beach Resort - All Inclusive and the Hotel Juli. Consider spending a few hours exploring Sea Gardens and Burgas Beach, which you'll find in Bourgas, 35 kilometres (21 miles) to the southwest of Kosharitsa. 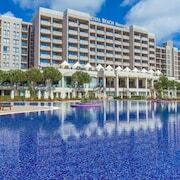 If you'd like to visit Bourgas, be sure to check out the Primoretz Grand Hotel & SPA and Hotel Bulgaria Burgas. Or stay in Tsarevo, 65 kilometres (41 miles) to the south of Kosharitsa, where you'll find the Oasis Resort & Spa and Primea Boutique Hotel. If you're staying in Tsarevo, set aside some time to check out the Georgi Kondolov Cultural Center and Church of Sveti Tsar Boris-Mikhail. Just because you are traveling in Bourgas - South Black Sea Coast, doesn't mean you can't indulge in your love of all things sport. You'll find Ticha Stadium 55 kilometres (35 miles) to the north of Kosharitsa. Book a hotel close to the action at the Dallas Residence or the Graffit Gallery Hotel. Burgas Airport is a convenient airport for flying into and leaving Kosharitsa. It is 25 kilometres (15 miles) drive away. 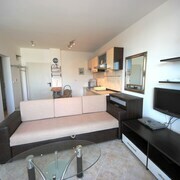 If you would like to stay nearby, try the The Clara Aparthotel & Residence or Atlantis Resort & SPA. What are the most popular Kosharitsa hotels? Are there hotels in other cities near Kosharitsa? What other types of accommodations are available in Kosharitsa? Explore Kosharitsa with Expedia.ca’s Travel Guides to find the best flights, cars, holiday packages and more!